When the Dow Jones Industrial Average fell over 500 points last week and global markets dropped 5% in a matter of days, investors everywhere began pondering the question: Is this just a brief dip in the uptrend, or a more ominous change of trend? Investors and money managers are trying to assess which markets and commodities might be topping out and which are still rising. If one market is topping out, then common sense suggests moving money from that position into an investment that is still trending up.Veritable armies of analysts are constantly seeking correlations and causal connections between global markets in commodities, stocks and currencies, all with the goal of anticipating which investments may be running out of steam and which are still strong or about to trend up. So are there any correlations between China's stock market, gold, the U.S. dollar and the U.S. stock market? Are there any discernible fundamental trends which can help us make our own investment decisions? 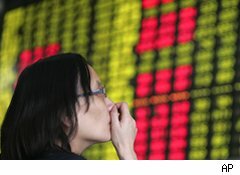 China: China's fast-growing economy is the engine that is pulling the world out of global recession. Gold: Gold's dramatic rise in 2009 was a seesaw reaction to the decline in the U.S. dollar: The dollar falls, gold rises. Fearing further depreciation in the buck, global investors turned to the yellow metal as a safe haven. U.S. dollar: The Fed printing trillions and the Treasury borrowing trillions combined to weaken the dollar. U.S. stock market: All those Fed and Federal trillions sloshing into the U.S. economy has ended the recession; the economy and profits are now both growing, which will boost stock prices. So how much truth is there in these consensus accounts of global finance? Entire books could be written on each story, and even more penned on the causal connections between all four: If the Chinese are buying gold and selling some of their dollar holdings, isn't that bearish for the buck and bullish for gold? The problem with this sort of fundamental analysis is that nobody really knows what the Chinese central bank is buying or selling, or what the consequences will be, as the global market is made up of millions of investors and transactions. This inherent uncertainty in any investment story drives many money managers to base their decisions on technical analysis --the movement of price and various indicators and trend lines as depicted on charts. The advantage of chart analysis is that it is not swayed by emotionally appealing stories which may or may not be accurate guides to future investment trends. The downside of technical analysis (often called "TA") is that it can become so complex and arcane that it buries investors under a mass of confusing complexity. There are dozens of indicators and numerous branches of analysis (Elliott Wave Theory, Fibonacci projections, and so on). There is a profound irony at the heart of technical analysis: If there was any one system which worked all the time, then everyone would use it, and it would consequently become ineffective as everyone pursued the same trade. On the other hand, TA has one profound advantage: It objectively displays the points at which the consensus becomes one-sided and the trend changes. When everyone is bearish and gloom hangs heavy, the trend is ripe for a reversal. And when everyone is complacent, positive that it's only onward and upward, that too signals a trend reversal is increasingly likely. The explanation is simple: When everyone who wanted to buy has bought, there's nobody left to drive the price higher. One way to look for trend reversals is to construct a very simple technical analysis model: price and the 50-day moving average (MA). In this very basic model, a "buy" is generated when the price moves above the 50-day moving average, and a "sell" is triggered when price drops below the 50-day moving average. Since the moving average smoothes the price trend, any move above the MA suggests an uptrend is beginning. Let's start with a chart of the FXI, a proxy for China's stock market. What is readily visible is the flattening of the 50-day moving average and the inability of price to stay above it. The present decline bears ominous similarities to June 2008, when the FXI slipped below the 50-day MA; that decline signaled a steep sell-off. Equally ominously, volume picked up during the recent sell-off. Increasing volume suggests conviction on the part of buyers and sellers, as the rising volume induces a cascade of buying or selling. One glance at the chart of the GLD fund (a proxy for gold) reveals that gold sports a very volatile price action marked by sharp spikes above and below the 50-day moving average. Despite this volatility, we can observe that the 50-day moving average tends to trend up or down as the price jumps up and down. Is the recent dip in the price of gold below its 50-day moving average just a brief dip in an uptrend, or the first signs of a reversal in trend? Only time will tell, as gold has a visible history of volatile price action. But if price fails to rise above the 50-day MA and stay there, then the 50-day MA will trend flat, signaling caution until a new trend establishes itself. Though the U.S. dollar has been on a seesaw with the price of gold recently, there is no hard and fast law regarding that correlation; the can rise or fall in unison or move independently of the other. What is instantly visible in this chart of the dollar-proxy fund UUP is that the 50-day MA has turned upward and the price has stayed above the moving average line. This is a signal that the downtrend has reversed into an uptrend. Why is the dollar strengthening? The technical analyst leaves that question to others. The Dow Jones Industrial Average (DJIA) has fallen decisively below the 50-day moving average. But the jury is still out on whether this is a brief dip like the drop in July 2009, or a reversal of trend like June 2008. If the DJIA fails to rise above the 50-day MA soon, and stay there, the odds favor the trend reversal scenario. But isn't the recession over? Aren't profits rising? The technical analyst does not consider these stories to be accurate guides to future price action. For the rest of us, TA acts as a confirmation or non-confirmation of the consensus story: if profits are rising but the market can't stay above its 50-day MA, that signals that the market isn't as confident in the story as the analysts espousing it.